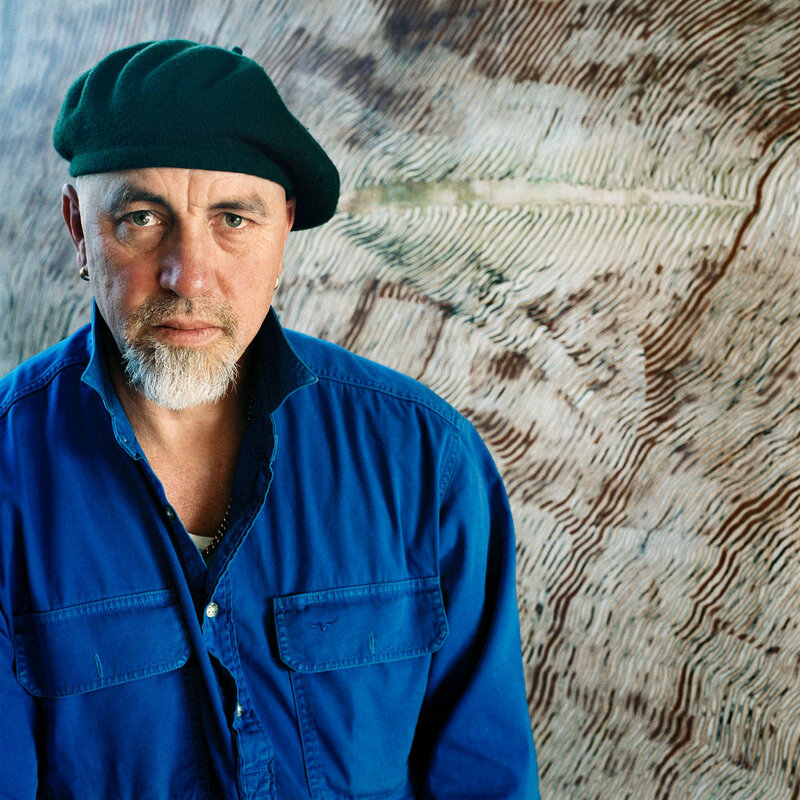 Painter Chris Nicholls, Wal Wal, VIC, 2007. Now deceased, Chris' work, known as ‘My River Paintings’ depicted the degradation of rivers due to the severe drought. Artist and lecturer Ewen Ross, Horsham, VIC, 2007. This work is from the series 'The Green Pick' which reflects the slow return of growth to a region severely affected by the drought. Artist Martin King in his studio, Brunswick, VIC, 2008. His painting titled ‘Floating is a Dream,’ was inspired by an artist residency in Broken Hill, NSW. Struck by the dire state of the Menindee Lakes. Martin uses motifs of birds, drought and flooding to evoke the fragility of our connections with the land and with other human beings. Basket-maker Virginia Kaiser, Broken Hill, NSW, 2008. Virginia’s continuing series ‘River Stories’ explores the Darling River’s tenuous state due to drought and misuse. Acknowledging local Aboriginal tradition, the vessels or ‘boxes’ are made from natural materials, and contain items relating to the river’s destruction such as carp bones or cotton. Artist and Gundijmara woman Marley Smith, Sebastopol, VIC, 2009. Her triptych of paintings represent the three major lakes of Ballarat, all of which were dry or at low capacity. Janet Goodchild-Cuffley, with her painting "Demeter Introduces Stage IV Water Restrictions," Malmsbury, VIC, 2008. In this artwork, Janet draws paralells between Australia's cycle of drought and Demeter's act of witholding growth and fertility of the earth. Artist Neil Fettling, Mildura, VIC, 2011 with paintings from his series titled 'Another Mallee History,' which explores early European settlement of the region. Drought and inappropriate farming practices meant that many of these properties failed. The discarded tin cans become "metaphors for the harshness of the climate, the lack of water, the lack of sustainability." - Interview, 04.11.11. Artist Kim Williams at her home in Port Kembla, NSW 2010, with a mixed media work titled 'Channel Country #1.' Says Kim, "the drought has had a big influence on my work in the past couple of years – not just my direct experience of drought and seeing the effect of the drought on rural areas, but also the political ramifications of drought and its prominent place in our national story at present." - Interview 11.03.2010. Artist Paul Lambeth, Ballarat, VIC, 2009, with his series 'If God is a place, then we are lost.' Paul describes this body of work as "...non-specific, meaning that they're not about a place or any...grand landscape vista but more about just using colour and shape, the formal elements of painting to evoke dry land." - Interview 10.03.09. Artist Denise James at Lambert's Swamp, Merbein, VIC, 2010 with her artwork entitled 'The Dance,' a beeswax sculpture inspired by the dryness of the swamp and her experience of Parkinsons.